The Model CSMSTRV2 is a communications and control platform designed for use with CS Series process control modules. The CSMSTRV2 uses a proprietary high speed serial protocol to communicate, via backplane connection, with up to 16 control modules, providing PID control of any process including temperature and pressure. Connect up to 16 Dual-loop PID control modules for process control of 32 independent zones. PID temperature modules also allow up to 32 ramp/soak segments per zone. The Master provides high-speed RS232/422/485 communication ports and an Ethernet port for connection to PCs and motion controllers. An extensive list of master and slave protocol drivers are available, including a serial driver for Omega stepper motors, to allow the CSMSTRV2 to share and exchange variable data with external devices. The 10 Base-T/100 Base-TX Ethernet port can also be used to connect and share data with other devices at high speeds. 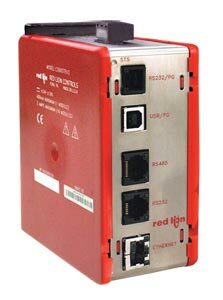 The CSMSTRV2 is programmed with Crimson software for Windows® 2000 or later platforms. The software is an easy to use, graphical interface which provides a means of communication configuration, as well as commissioning and calibration of new systems. Note: Controllers come with termination plug, terminal power block, and complete operator's manual.